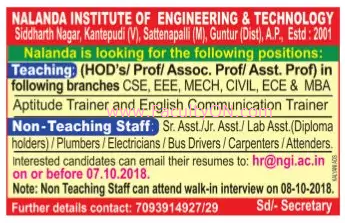 Nalanda Institute of Engineering and Technology, Guntur has advertised in the SAKSHI newspaper for recruitment of Professor / Associate Professor / Assistant Professor / HOD Plus Non-Faculty jobs vacancies. Interested and eligible job aspirants are requested to apply on or before 07th October 2018 (for teaching faculty including trainers) and walk-in on 08th October 2018 (for non-teaching only). Check out further more details below. How to Apply: Interested and eligible candidates are requested to send CV along with all copies of certificates / testimonials and recent PP size photos to the email address provided here. Non-Teaching Candidates can attend the Walk-in interview directly without applying. The walk-in venue is provided below. The date and time of walk-in for non-teaching is 08th October 2018 at 09:00 am onwards.